Unfortunately for Cenk Tosun, his first taste of English football will be remembered for all the wrong reasons from Everton's perspective. The Turkish striker certainly did not disgrace himself on his debut and his performance was the only bright spot for Sam Allardyce. Yet there was little that Tosun could do about another hopeless away performance from Everton, who collapsed in the second half, and it was not his fault that he was reduced to playing second fiddle to Harry Kane. 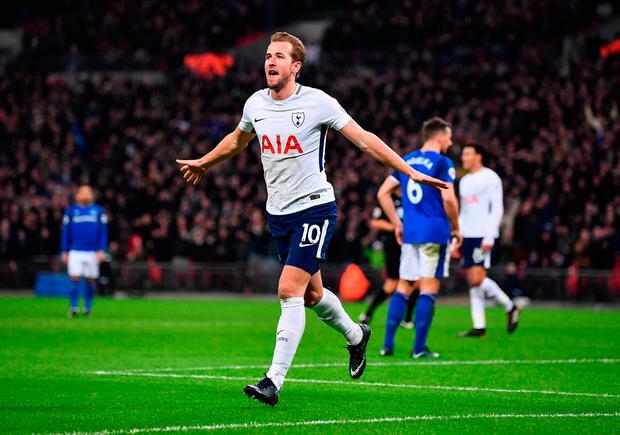 Having ended 2017 as Europe's most potent striker, Kane shattered yet another statistic here, scoring twice to break Teddy Sheringham's record of 97 Premier League goals for Tottenham Hotspur. In the process he took his tally against Everton to four this season, helping his team move level with Liverpool in fourth place and combining brilliantly with the waspish Son Heung-min. The early pattern was predictable. 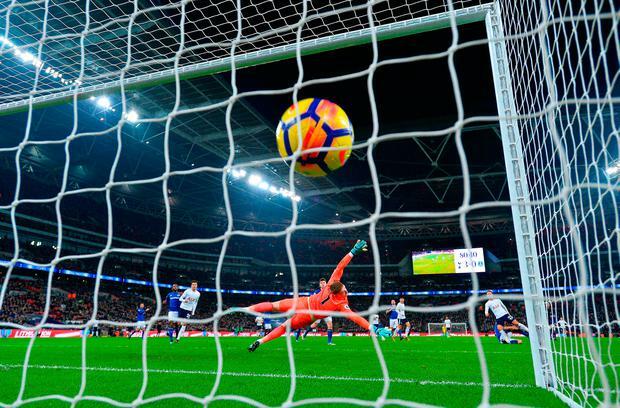 Tottenham have strained to crack stubborn guests on several occasions this season and it did not come as a shock to find that Everton were happy to keep men behind the ball for long spells, allowing their hosts to have the ball in unthreatening areas. Allardyce had instructed his team to maintain a disciplined structure and there was little to concern the visitors during the first 20 minutes, other than the moment when Son skimmed the top of the net with a glancing header. However, Everton's approach was not limited to keeping Tottenham at arm's length. Failing to react after selling Romelu Lukaku last summer has been a major factor in their muddled campaign, but the arrival of Tosun from Besiktas has given them fresh hope. Allardyce threw his £25m striker straight in at the deep end, handing him the responsibility of leading the line on his own against one of the division's stingiest defences, and Everton could certainly take encouragement from their new signing's first touches in a blue shirt. Tosun's speed and movement made him an elusive opponent for Davinson Sánchez and he linked dangerously with Wayne Rooney at times, particularly when creating a shooting opportunity for the ex-England striker in the 16th minute. Rooney's strike was rushed, however, and he was also half-a-yard offside when Tosun found him unmarked with a near-post flick from Gylfi Sigurdsson's corner midway through the half. Tottenham were relieved to see the flag go up as Rooney's header flew into the roof of the net and that scare woke them up. Immediately there was a greater intensity to their play, with Kane testing Jordan Pickford's reflexes with a curling shot from 18 yards, and they took the lead with an impressive goal. Everton had been open down their left side, with Sigurdsson struggling to track Serge Aurier's raids from deep, and Christian Eriksen took note of that weakness, finding the buccaneering right-back with a superb crossfield pass. Aurier drove a low centre into the middle, enabling Son to emulate Jermain Defoe by becoming the second Spurs player to score in five consecutive home games in the Premier League. Son's tap-in steadied Tottenham, though Everton continued to press. James McCarthy spurned a decent chance after more good work from Tosun and although Ben Davies was keeping Yannick Bolasie quiet, Allardyce had seen enough to believe that his team had a realistic shot of making it an awkward evening for Mauricio Pochettino's players. Yet Everton's hopes of reeling in Tottenham lay in tatters two minutes after the restart. 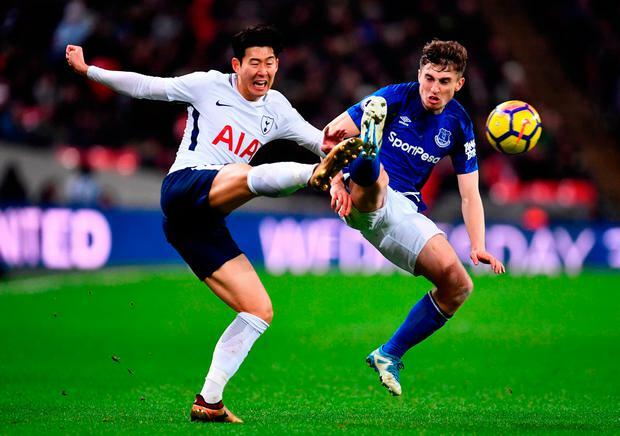 This time Son was the creator, demonstrating his skill and dribbling ability by twirling away from Jonjoe Kenny, rendering the inexperienced right-back an irrelevance as the move unfolded. Mason Holgate was unable to stop Son from fizzing the ball into the middle, where Kane was waiting to guide it past Pickford. Everton started to concede possession with alarming regularity in midfield, creating problems for themselves, and Allardyce was giving in to the inevitable when he replaced Tosun with Dominic Calvert-Lewin in the 62nd minute. Tottenham had already pulled further clear by the time the Turkish forward trudged towards the touchline. Eric Dier advanced down the right, nobody bothered to confront him and Everton's defence stood still as the midfielder's low cross reached Kane, who has not made a habit of missing from six yards out. Rooney's late booking for an ugly chop on Jan Vertonghen encapsulated Everton's frustration and Tottenham polished off a handsome win with a stunning fourth goal, Dele Alli's back-heel teeing up Eriksen to hammer emphatically past Pickford.